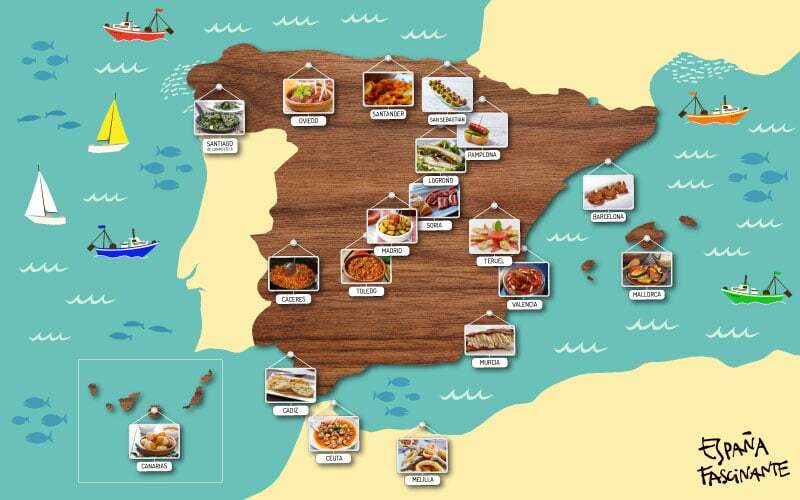 We propose a route through the tapas of Spain that you will not be able to resist. Although in each autonomous community the tradition is different, there are a series of recipes that you have to eat whether or not you like Spanish tapas. Today we are going to focus on those cities that hide gastronomic treasures in the form of tapas. The tapas culture is deeply rooted in Spain. Whether in the form of pintxo, tapa or ration, there are some essential dishes depending on the town. Of course, although we have linked some of these tapas to a specific city, we know that they are dishes that are usually served all over the community. This is a selection of very characteristic tapas from Spain, some older and some newer… which would you include? We start with the capital of Spain asking for a delicious potato omelette pincho to whet our appetites. There are all types: dry, juicy, with onions…. The potato omelette is a typical tapa in the whole country, but in Madrid it takes on a special shade. 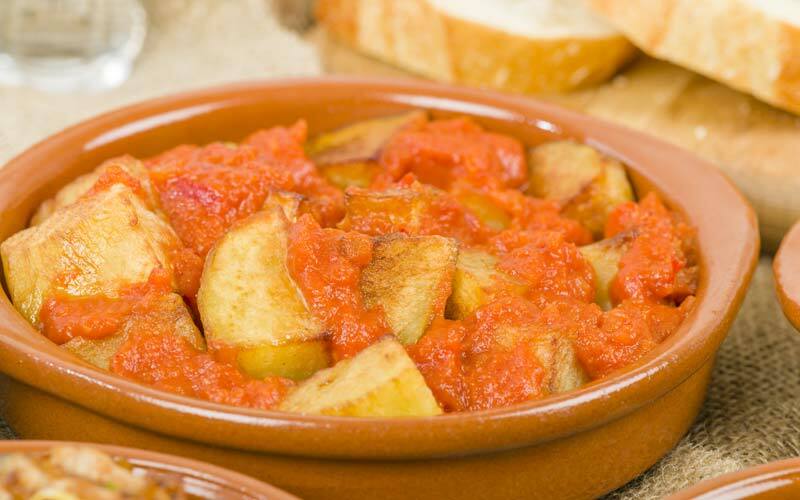 But if you’re in the capital, what you have to order (even if it’s the last thing you do) is a tapa of patatas bravas. This sauce gives the potatoes a very characteristic spicy taste. From here we move to Cáceres, in Extremadura, the great unknown. If you decide to have a drink in a bar, you will surely be served a tapas of torreznos or Extremadura crumbs. A real classic. In Castile and Leon we pass through Soria, where the torreznos are also typical, tapas from Spain with the guarantee brand of the province, which is why the quality of this product stands out. In Salamanca we tried the mug, a tapa that is made with the pig’s mask. Its exterior is crunchy and its interior is mellow. If you pass through Zamora, the Moorish skewer will be waiting for you. The tapas of Spain are very varied and we can choose from a large selection. 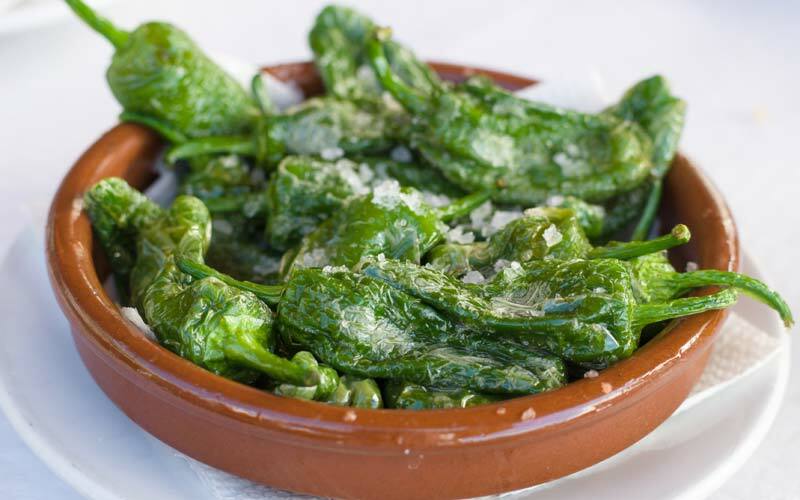 In Santiago de Compostela the Galicians enjoy the popular Padrón peppers, but be careful! Because some of them are spicy and some others are not. 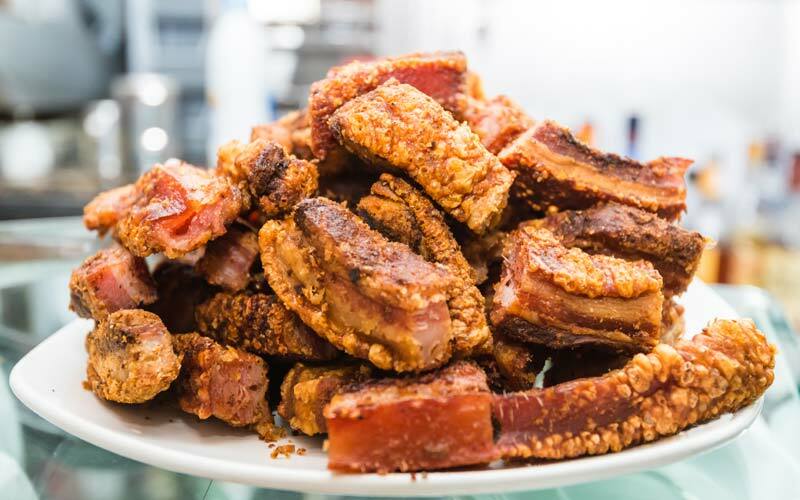 In Galicia you can also try the delicious raxo, a marinated and fried pork loin. We move to Oviedo o enjoy another of Spain’s most beloved tapas, chorizo a la sidra (cider). With such a traditional drink we could not count on a less tasty dish. The spectacular Santander awaits us with half a ration of rabas, a tapa that is mandatory if you pass through Cantabria. It is one of the most typical appetizers and is usually accompanied by a caña, vermouth or wine. They are served in many bars and restaurants. In Bilbao they serve us one of their oldest pintxos because, as you know, tapas are called pintxos here. Boiled potato, onion, lettuce and olive are the ingredients of ‘El grillo‘. In San Sebastian we eat a genuine ‘Gilda‘, a pintxo with anchovy, chilli and olive. The ‘poteo’ culture is not only Basque, but also Navarrese. Some days of the week (usually Thursday), there is an offer of cane and pintxo. 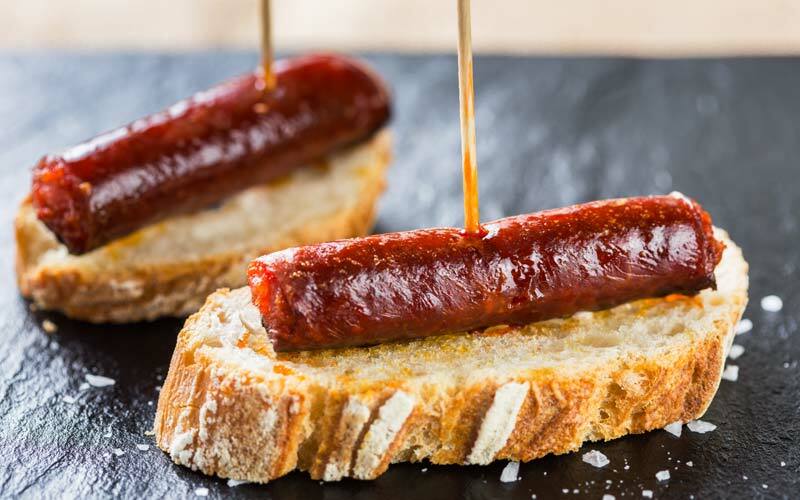 In Pamplona the most typical is the pintxo de chistorra, a simple delicacy of which there are few left. Thanks to the residents of Logroño we will be able to enjoy a “marriage” without being married. This is the name of a small sandwich made with anchovy, green pepper and anchovy with a dash of oil. We continue with the tapas from Spain until we reach Teruel, where we are going to order some Delicias de Teruel as an appetizer, toasted with tomato and ham. It is a recipe that can also be ordered for breakfast, with tomatoes from the popular orchard of Aragon and Teruel ham with designation of origin. We know that Barcelona has many well known tapas and dishes, but the Barceloneta neighbourhood has long surprised its guests with delicious stuffed bombs. 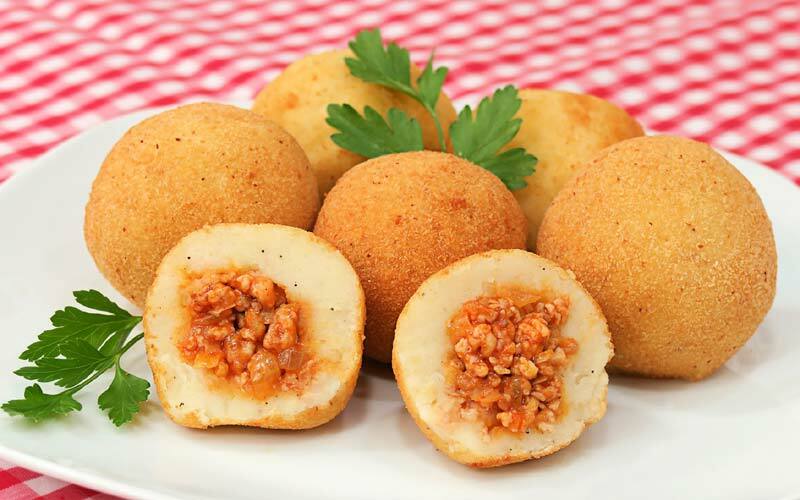 This kind of croquette made with potato, minced meat and sauce has become one of the most popular tapas in Barcelona. We still have some room in our stomachs to go to Valencia to try titaina. It is one of the healthiest tapas in Spain, similar to sofrito. It is typical of the Cabañal-Cañamelar neighborhood. Toledo and, in general, the whole of Castile-La Mancha, is perfect for ordering a tapa of pisto or manchego migas., both traditional recipes with a long journey. Every Spain tapa has something particular that makes it different: an ingredient, the way to do it, the history… In Murcia one of the cold tapas with more tradition is the “marinera”, salad in a toast with an anchovy. The south heat some of the Spain tapas more tasty. Although we know that Granada is the queen of the Spain tapas, Cádiz has its camaron omelettes and papas aliñás. These are some of the most popular in the andalucian restaurants. The “montaditos de pringá” in Seville, the coquinas from Huelva or the sardines from Málga are some of the Spain tapas that we can try in Andalucia. 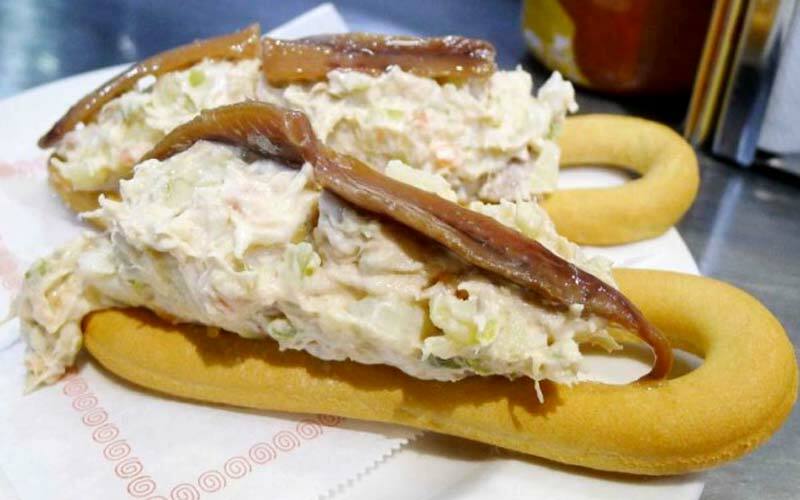 All the tapas in Spain have something special that makes them unique: an ingredient, the way they are made, their history… In Murcia, one of the coldest tapas with the longest tradition is “la marinera”, a salad on a toasted bread roll on which an anchovy is placed. There are two other varieties of this tapa: the sailor, in which the anchovy is replaced by a anchovy in vinegar, and the bicycle, which will be the doughnut with the salad. The southern heat attracts us with some of the tastiest tapas from Spain. Although we know that Granada is the queen of Spanish tapas, Cadiz brings us its camaron omelettes and seasoned potatoes. They are one of the most popular tapas in Andalusian bars and restaurants. The “montaditos de pringá” in Seville, the “coquinas” in Huelva or the “sardinas” in Malaga are just some of the Spanish tapas you can try here. If we go to the islands, Palma de Mallorca awaits us with a tumbet, a vegetable-based recipe, and Las Palmas de Gran Canaria and Santa Cruz de Tenerife delight us with some wrinkled potatoes with mojo picón. In Ceuta we can order the snails in the Ceuta style and in Melilla, the fish fries.